The highlight of our trip to Chiang Mai was a drive two hours south to Doi Inthanon National Park. One of the largest parks in the Kingdom, this is the home to the “rooftop of Thailand”, Doi Inthanon peak. Many people who visit Thailand stay in typically touristy areas, particularly the biggest cities and the beach towns. 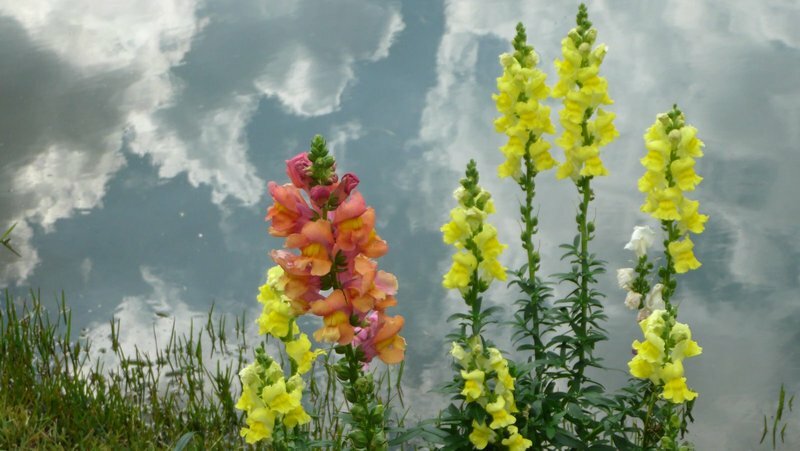 As lovely as these are, they miss out on the spectacular natural beauty to be found in this country. 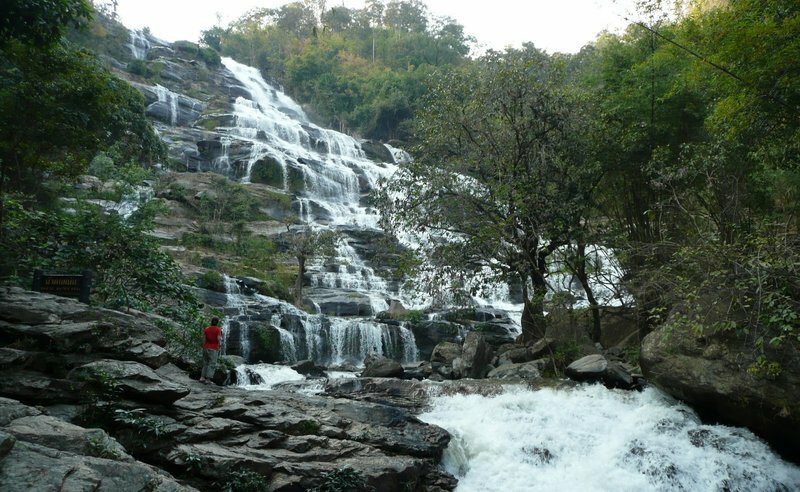 This park features several beautiful waterfalls including the impressive Vachiratharn Falls. These falls are all located just short walks away from parking areas making them accessible to almost everyone. Even several months after rainy season, these falls are going strong! There are also hiking trails if you want to get more of a workout. 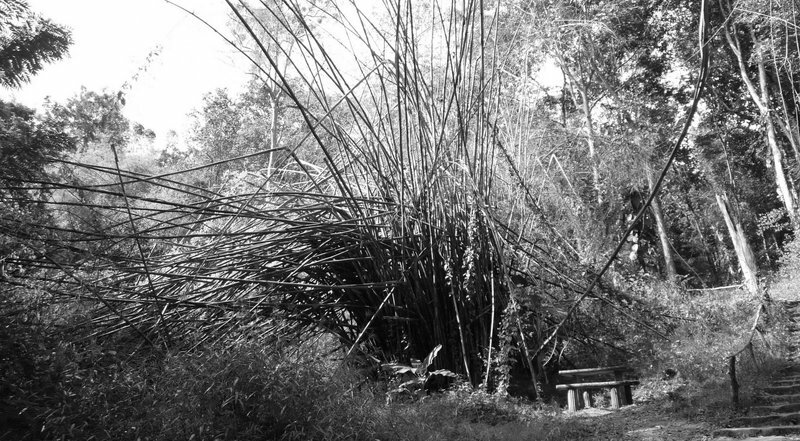 On our way to the top of the falls, which turned out to be less interesting than viewing them from down below, we found this interesting stand of dead bamboo. There were also several disused picnic tables on the way up, all in areas that didn’t seem conducive to a pleasant picnic. 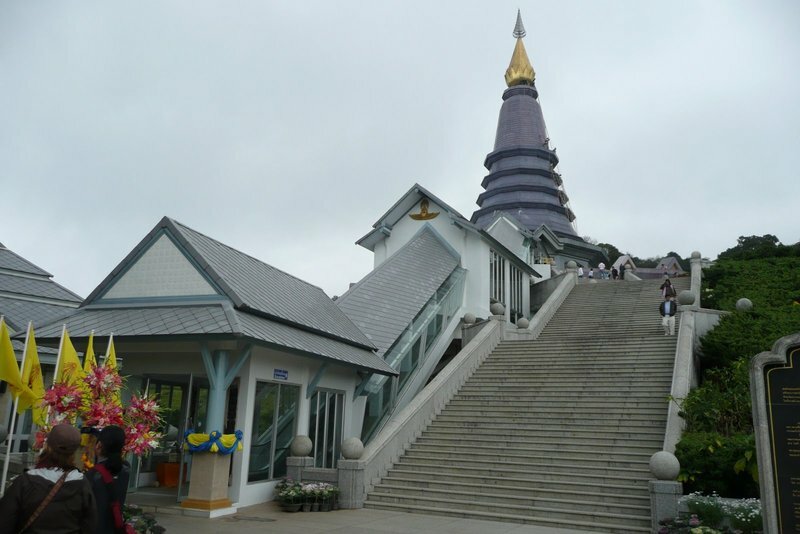 Near the summit of Doi Inthanon are a pair of chedis built by the Royal Thai Air Force to commemorate the fifth cycle (i.e. 60th) birthdays of their majesties the King and Queen of Thailand in 1987 and 1992, respectively. These are beautiful chedis, both done in modern style. They are very distinct with the King’s chedi having very dark stone and the Queen’s being built in with a violet hue. Since my last visit in 2006 they have installed enclosed escalators to make the climb to the top easier for the thousands of elderly Thais who come here to pay their respects. 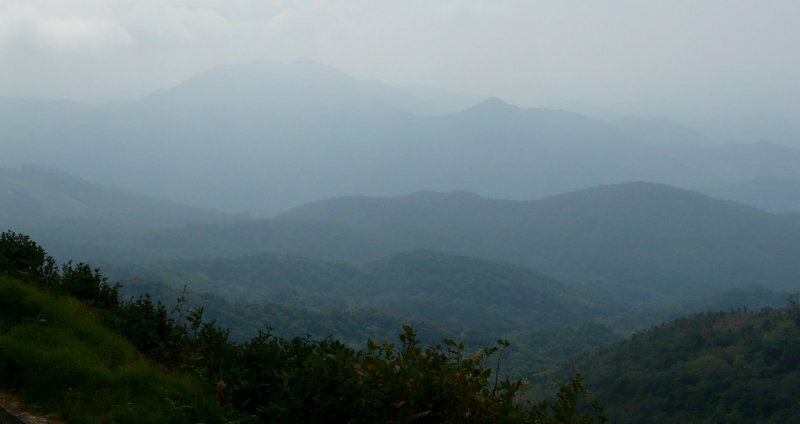 The hazy, cloudy view from the top of Doi Inthanon looking southwest towards Burma. At the top of the peak (2,565 meters / 8,416 feet as marked by the small round metal plaque on the concrete pedestal in the foreground of the picture) is a small shrine to the memory of the Phra Chao Inthawichayanon, one of the last kings of Chiang Mai until his death in 1897. During his 27-year reign, King Inthawichayanon was very concerned about the preservation of the forests and mountains in what was still an independent tributary Lanna kingdom. Following his wishes, the king’s remains were interred at this spot on the top of what was then called Doi Luang. 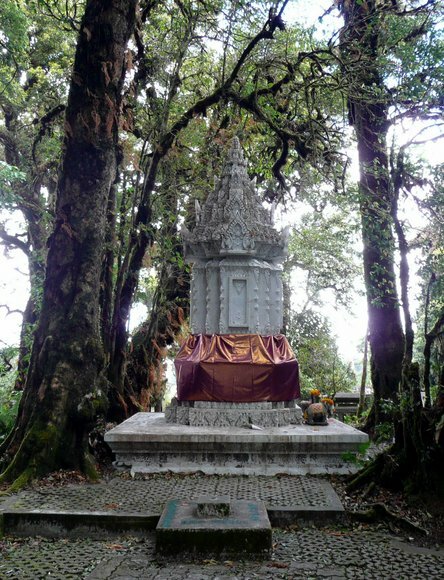 The mountain was subsequently renamed Doi Inthanon. It was also during his reign that the remnants of the Lanna kingdom were finally annexed into greater Siam. One could argue that the political friction in modern-day Thailand (which has a very distinct north versus central split) has its roots in these ancient annexations. Part way down the mountain is the Royal Agricultural Station, a large garden area that has acres of greenhouses where different types of plants are grown. The purpose of the project is to identify different species from around the country and also cultivate other species that may be well-suited to Thailand’s different climates. As an example of some of the work done by various royal-sponsored agricultural foundations, opium production in Thailand (which once used to be the world’s top producer) has almost entirely vanished, being replaced by cash crops such as coffee and macadamia nuts. Reflection in the pond. The sun kept trying to break through but it rarely lasted. My personal favorites, the fuchsias. The climate up here on the mountain is very similar to that of my childhood home in the San Francisco Bay Area. We had fuchsias in our backyard that my father tended to with great care. Seeing these in the greenhouse brought back many memories. I used to snap open the flowers, enjoying the “pop!” sound they made. 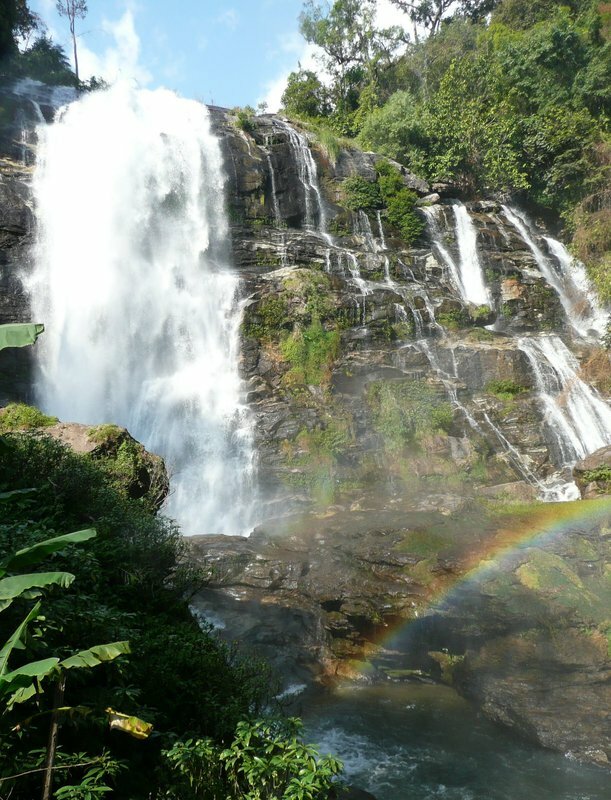 Mae Ya Falls, Doi Inthanon National Park – Chiang Mai Province. Our friend Kari is standing in the distance taking pictures. Chris hoping that there isn’t a sudden flash flood! I’ll continue tomorrow with the second road trip in Chiang Mai, up to Doi Suthep, along with some video. This entry was posted in Uncategorized and tagged Chiang Mai, Doi Inthanon, nature, Thailand, travel, Waterfalls by christao408. Bookmark the permalink. Nice photos! You captured the rainbow pretty well! And those tulips!! This post is really amazing Chris! 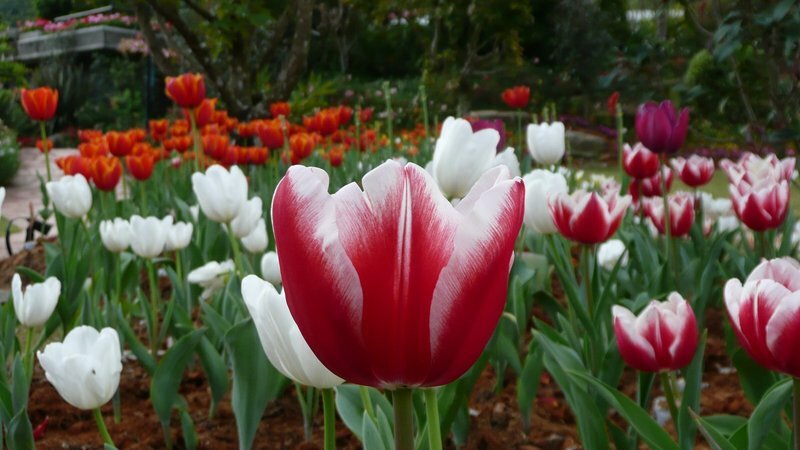 Beautiful photographs… especially the tulips! Thanks for bringing us to Chiang Mai (in pictures). The waterfalls and rainbow are simply breathtaking! Really nice pictures! Is that King Doi any way related to the one depicted in “King and I” movie? 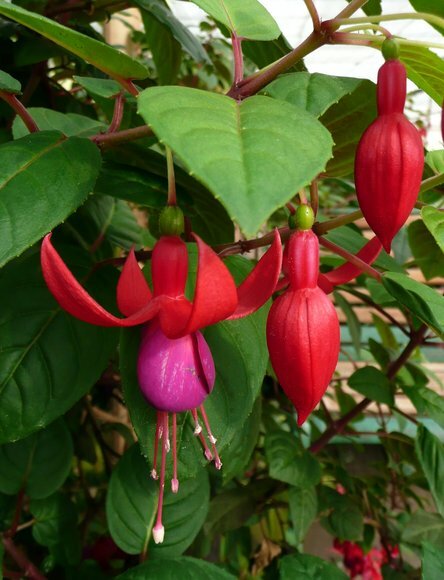 Oh, I did not know that one can make sound with fuchsias flowers. Will pop one next time to find out, hehe. Indeed breathtaking terrain – especially the falls of course. We don’t see that in these flatlands. Thanks for the tour. I’m looking forward to the next installation. @stevew918 – “Doi” means mountain. King Inthanon was his name, actually. No, not related to that king. The King referenced in “The King and I” was King Rama IV, also known as King Mongkut. He reigned from 1851-1868. @murisopsis – Glad you liked it. Yes, Central Thailand (around Bangkok) is also flatland so getting to the mountains is a nice change of scenery. @yang1815 – Thank you. @icapillas – I was lucky to see the rainbow and have it photograph so nicely. 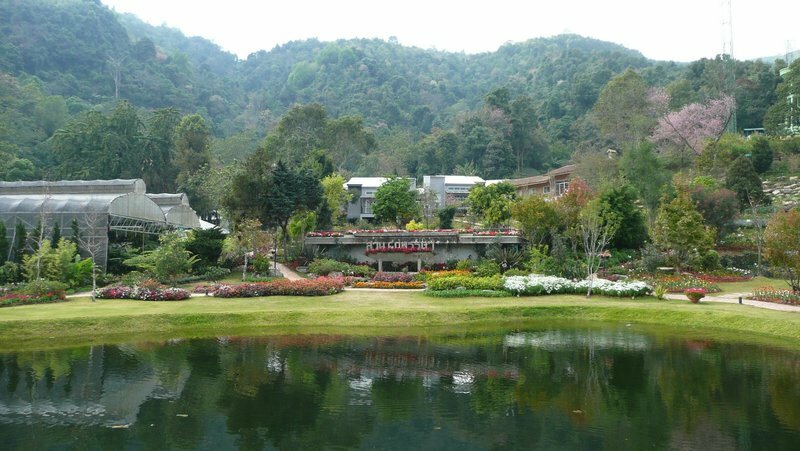 @lcfu – Definitely go to Doi Inthanon next time you are there. Very beautiful. @Dezinerdreams – @CurryPuffy – Glad you liked it. The tulips were gorgeous and tremendously out of place! The falls are so beautiful. Breathtaking views! The first photo with the rainbow is amazing! Such wonderful pictures! And informative bit of history of the area too! I love these posts: A perfect combination of photography, a tour, and a history lesson all in one. I can’t believe that’s a reflection in a pond — when I looked at it, I couldn’t figure out what was going on at first. And the waterfalls — while not grand and massive, I love the way they trickle like that. Our waterfalls here tend to be like this also. I thought that was the sky… not a reflection too. 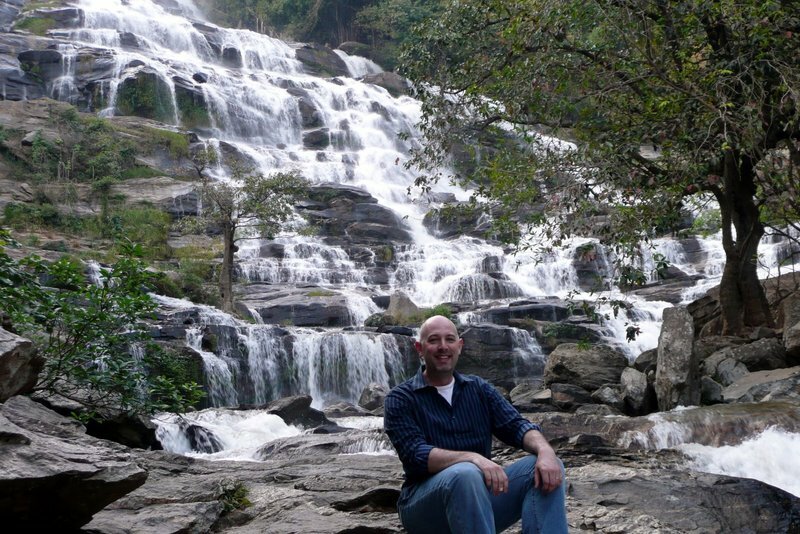 The waterfall is pretty – they don’t all have to be big and powerful. I’m curious if you rented a car or if you hired a car / driver to take you there. @ElusiveWords – @arenadi – Hmmm… I’m feeling inadequate here. The waterfalls were both actually pretty big and powerful. =( As for your other comments, though, I’m glad you liked the mixture of content Mike and I hired a car and drove myself, Matt, although you could easily hire a driver, too. @doiturselfer – Glad you liked it. We didn’t get the opportunity to visit the North while you were here. Next time. @waiszeblogs – @everyday_yogi – It was a beautiful waterfall and I’m glad the rainbow turned out in the pictures. @Wangium – You need more reasons? =D@TheCheshireGrins – I didn’t want to leave; it was so relaxing just listening to the falls. @christao408 – Ah, no — those are the kinds we have here as well. I think they’re beautiful; but not gigantic like say… niagara falls, near where I grew up. Now that you mention it though, and I’ve taken a better look at the photos, I think I might have had some kind of perspective perception issue when I first looked at these photos; because they looked small then. Odd. I remember the trip I had with Wit there. It really is enchanting! As usual, great photos. Who usually takes the most, you or Tawn? @marc11864 – Tawn doesn’t photograph very much. I tend to shoot more. @arenadi – Okay, my waterfall pride is restored. wow, i can’t wait to go there! i will one day for sure!!! @MAXIMO – I’m sure you will. Hopefully sooner rather than later. mae ya falls looks breath taking. are people allowed to go across it? @rudyhou – There’s nothing prohibiting it but the narrowest section at the base is maybe four or five meters wide and looks pretty deep and fast-moving. Don’t know that I’d try it.